You need to know what conditions, infestations and diseases to look out for. As a rule alpacas are really hardy. But, like all livestock, they can go downhill fast so need checking at least once a day. Pregnant females or females with young need extra care, with more frequent checks. The more time you spend with your herd, the better you’ll get to know them and the easier it’ll be to spot when they’re not feeling their best. The earlier problems are detected, the better the chance of a fast recovery. It’s very important to get to know your herd intimately, since alpacas don’t tend to let you know they’re feeling poorly until they’re very sick. What does a poorly alpaca look like? Rather like a poorly human! Watch out for a lost appetite, lots of lying around, not joining in with the rest of the herd, breathing and posture problems, lameness, runny eyes or nose, or simply an animal that looks down in the dumps. It’s good to know that because their fur is so thick, flystrike isn’t usually a problem. It is vital that you know where your alpacas have come from – including who bred or owned them previously and where they were kept. After all you are investing capital in the purchase of your animals and need to know they are healthy. You should ask the disease history and treatments given, and ask the bTB history of the holdings involved. You should always ask for bTB testing, and be very wary if it is refused. Of course, testing is no absolute guarantee of freedom from disease, and can be more or less able to find bTB (the test’s sensitivity) depending how the test is interpreted. In some cases the test may only be around 55% sensitive, so all normal precautions and biosecurity should still apply. Alpacas can show no symptoms of bTB for a long time, while infecting other herd members and putting handlers at risk. This is because they are high altitude animals and can survive on a small amount of oxygen so for instance in the case of a lung infection they would not look ill until it was too late. It does not generally kill them quickly but can take years with no apparent symptoms. Very often the first symptom noticed is when the alpaca is close to death or is found dead, often with huge levels of infectious disease. The reason why we are mentioning this is because bTB is a zoonotic disease and can infect humans. It is not simple to treat in humans, nor is there a guarantee of a full cure. It has to be taken seriously. At the moment testing is voluntary however it has been agreed with the BAS that good practice should be that animals are tested at the point of sale. 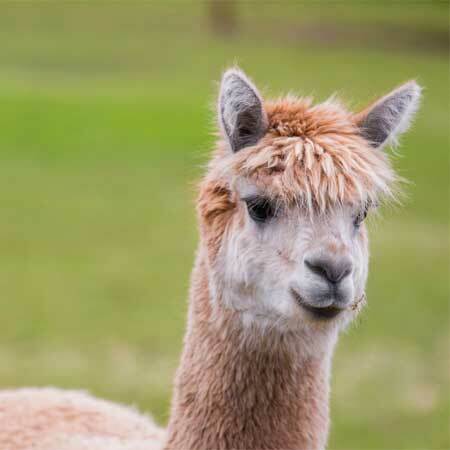 Mites can be a problem in alpacas, making the animals itch. You can easily spot mites thanks to the dry crusty skin they cause on the alpaca’s legs, which can quickly spread across the whole body. When the skin gets infected, you have a miserable animal on your hands. Thankfully regular, everyday Frontline dog flea spray does the trick. Spray it in between the alpaca’s toes up to the first joint, and make sure you treat the entire herd otherwise the mites will return in no time, passed between animals. We use soothing peppermint udder cream to soften dry scaly skin, and if any bare bits appear we put sun cream on. Liver fluke, AKA Fasciola hepatica, is found all over the world. It mainly affects cattle and sheep, but can also affect alpacas, goats, horses, pigs, rabbits and deer. It often becomes an issue when we’ve had lots of wet weather, but can easily be treated thanks to a dose of Fasinex in the spring and autumn. When buying alpacas for breeding, always get a vet to check the animal or animals over before you buy. Most livestock can be poisoned by oleander, rhododendron and laburnum, and alpacas are no exception. Take care to fence them off and prevent them seeding in your paddock, don’t let them overhang into the paddock, and don’t let your herd anywhere near pruned cuttings. Alpacas might not drink a lot, but they need constant supply of fresh, clean water or they can easily dehydrate. These friendly, mellow animals are a real pleasure to keep. If you’d like advice from experts about keeping your herd in tip top condition, get in touch.